I’m not sure if you guys know that I am a huge thrift store bargain hunter and I am always looking for something to up-cycle. For the people who haven’t heard of up-cycling, it’s the process of converting old/discarded items into something useful and beautiful. 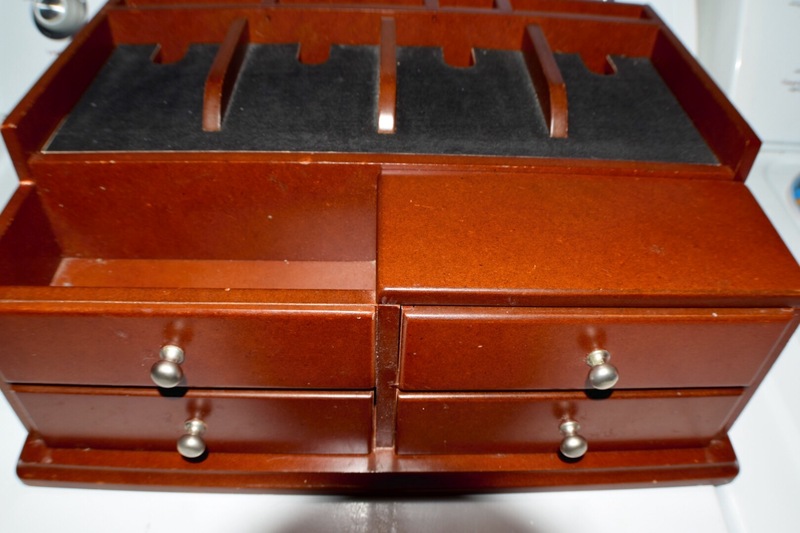 I’ve completed several projects, however the one I would like to mention today is an old desktop organizer. Some may not be familiar with these old clunky things because they are made more sleek and efficient now. With digital filing there hasn’t been much use for these lately. I paid $6 for this at my local thrift shop, which gives the proceeds to the Holy Redeemer nuns. Good deed of the day….accomplished. I am not sure what the felt liner on the top back-end was used for so if anyone remembers please comment and satisfy my curiosity. The section with the felt actually lifts up and there is a large storage space underneath. The only preparation involved was to give it a good cleaning with soap and water, cleaning is a must if you want a flawless finish. 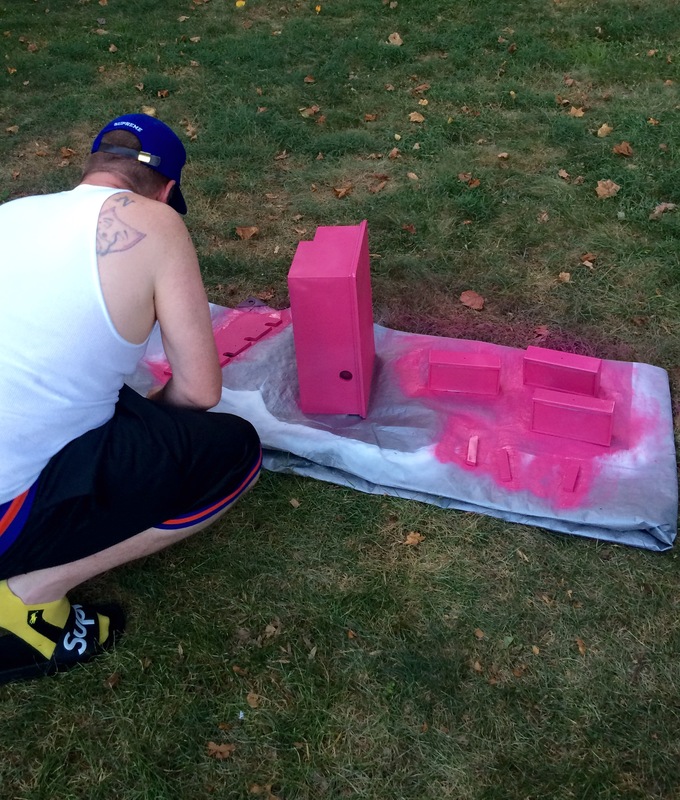 just make sure it is completely dry before painting or you will have some water spots. I also removed that strange felt from the top. It was a just a sticker and removed fairly easy. Next I removed all the hardware, which was in pretty good shape, so I put it all to the side for re-installation. 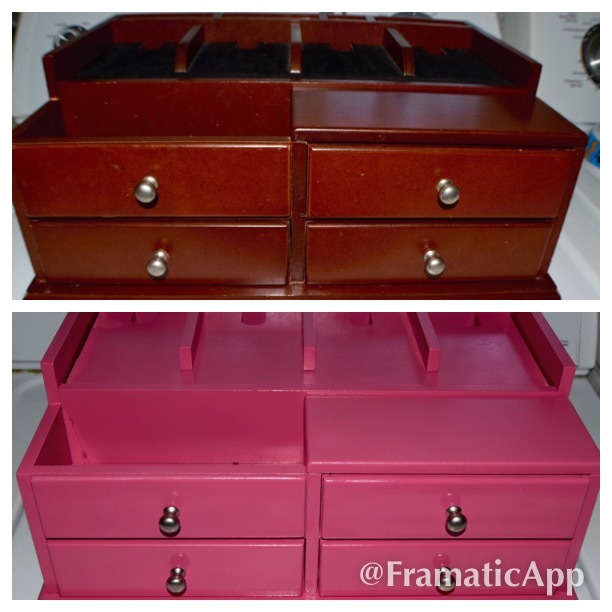 After poking around in our garage, my husband found a hot pink color that we both thought would look great. 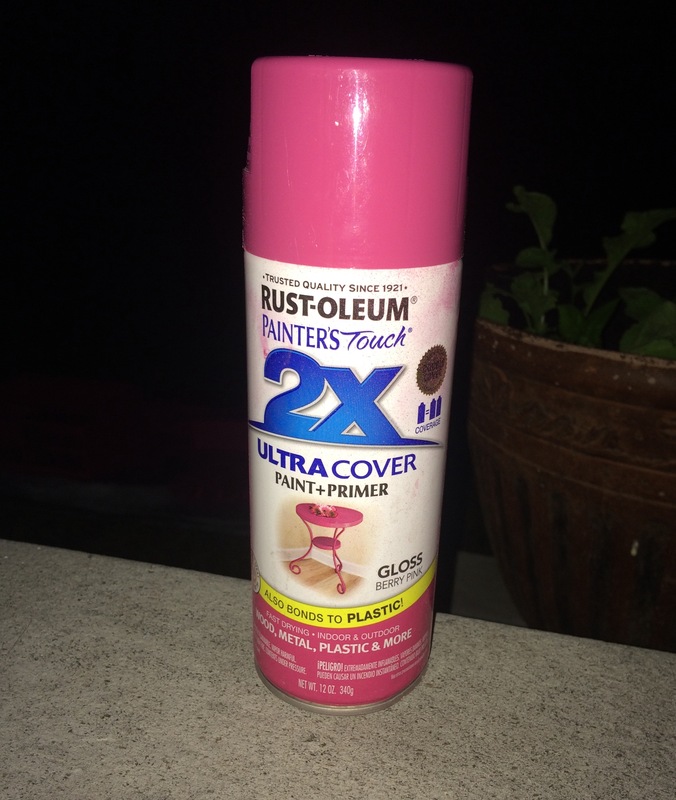 I did not have to prime this because, my husband is an expert spray painter, and he used Rust-Oleum’s Ultra Cover Paint and Primer spray paint. It took three coats and we allowed each coat to dry for one hour. I also let this cure for two days before use. 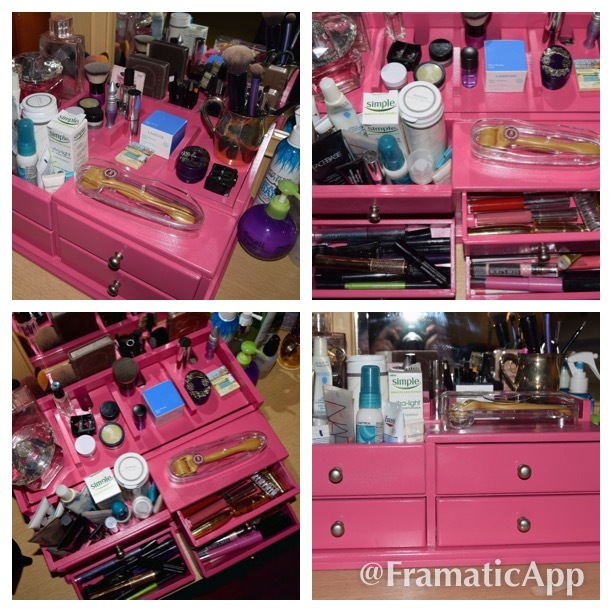 Together we turned this obsolete piece of furniture into a beautiful makeup organizer. I couldn’t be happier with the finished product! It’s, hot pink, super shiny, it’s made tons of space on my dresser, and with easier access I can quickly find what I am looking for. Just look at the pictures below, with my beauty products displayed so gorgeously. I just realized, in the last few days, that a lot of beauty products I had stashed away are getting way more use. 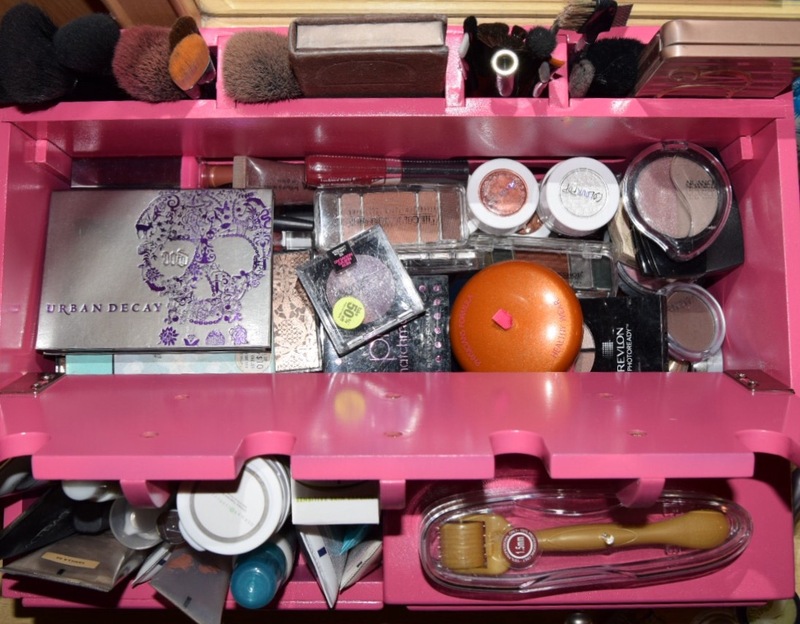 You guys…if you have not organized yet then you need to get on it!! It will make your life so much easier and I guarantee that you will experiment with your products more frequently. 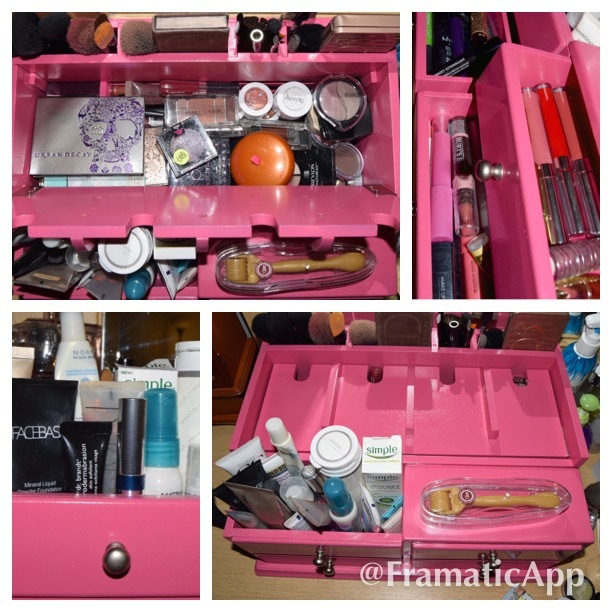 Those beauty products that are sitting in a drawer or the bottom of your bag will finally get some use. Here is that space under the back lid that has a ton of extra storage. I’m not sure if you can tell from the photo, but the very back had the perfect little cutouts for longer brushes and full eyeshadow palettes. I have two of my Urban Decay Palettes sitting back there. Huge thank you to my husband!! He does the absolute best work with anything I drag home from the thrift store. Little does he know I need about 3 more of these babies. Lol. Hope you enjoyed our little project and get inspired to work on your own! As always, thanks for reading and feel free to give me some lip below. Wow that’s awesome sauce!! And I love the color 👏👌. I would like something like this if I had a vanity. Thank you!! Right now it’s sitting in my dresser. 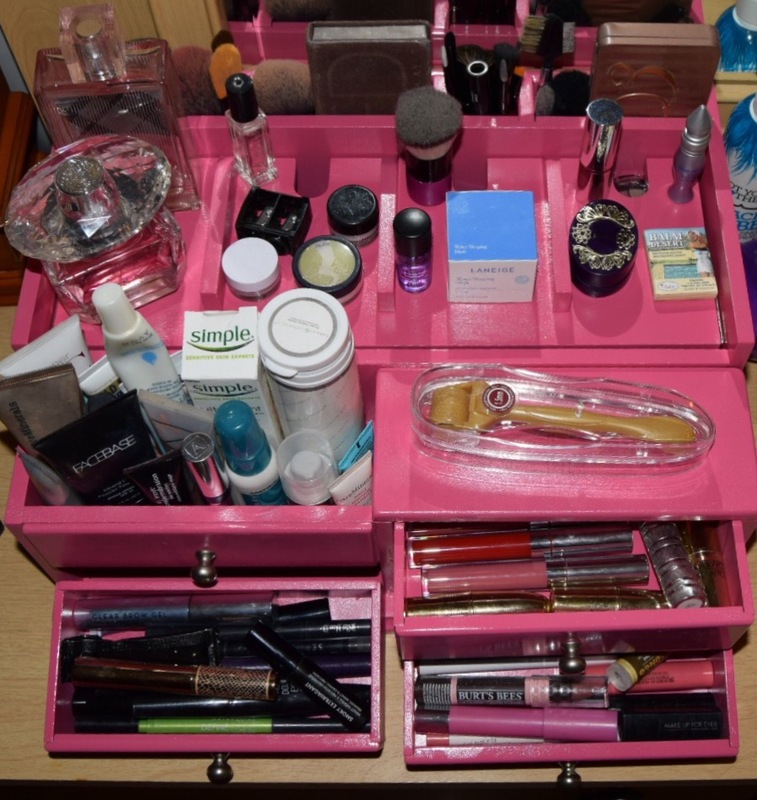 It does take up space but you will be organized! That sounds amazing! I cannot wait to see what the antique vanity is going to look like, probably amazing! Wow! Great job! It looks amazing! Thank you!! It’s been weeks and I’m still excited about it. I don’t blame you! You deserve it!! Thank you and I appreciate you reading my post! !